Are you scrolling (and scrolling) online for a party theme that will infuse your next party with excitement and a celebratory atmosphere? 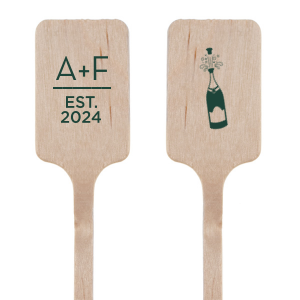 Are you ready to pop the bubbly with your friends to honor a milestone birthday or an upcoming marriage? 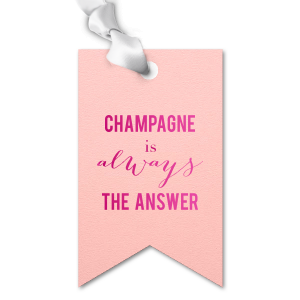 If you answered “yes” to either of those questions, a champagne party may be exactly what you’re looking for! Perfect for a bridal shower or even a classy bachelorette party, a champagne party offers a fun and fresh way to celebrate! Scroll no more! You’ve found the answer for your next party, and we have plenty of champagne party ideas right here. A champagne party can be as elaborate as you’d like it to be, or it can be a simple gathering your nearest and dearest with champagne and strawberries. 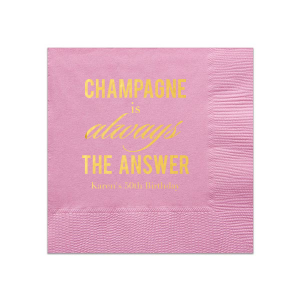 However you want to scale your event, personalized cocktail napkins will pair perfectly with the stems of champagne you’ll be passing. If you’ll be offering a champagne bar, custom coasters and paper straws with custom straw tags offer a layer of personalized style. If you want to take some inspiration from the beauty of a freshly poured glass of champagne in your party decor, remember that For Your Party offers foil stamping on our paper products in the color “champagne” and several complementary colors. 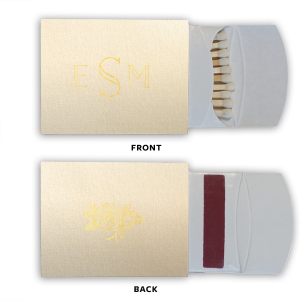 Your custom designed custom matches or custom favor boxes can coordinate with your beverages! It’s win/win! 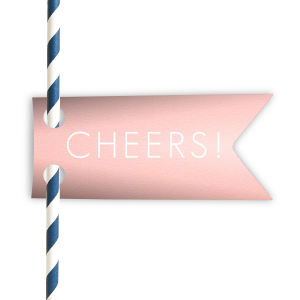 Or, design your personalized cocktail napkins on our shimmer napkins, and soon your personalized shimmer cocktail napkins will sparkle right along with everyone’s drinks as you’re “cheers”-ing! A champagne party is kind of like a wine and cheese party’s fun, upbeat younger sister! Take advantage of the excitement that popping open a bottle of champagne brings and host your most memorable party yet! In the ocean of party planning information available to us online, it is delightful to find a reliable and stylish voice like Kara’s at Style Meets Soiree. Kara recently featured a Champagne Party on her blog, and her tabletop styling and party details are on point. If you are slated to host a bridal shower or classy birthday celebration in the near future, be sure to read up on what she has to say. A champagne party is perfect theme for a party that you want to be elegant and luxurious, but also super fun. It’s impossible to escape the celebratory atmosphere that comes along with featuring champagne as the beverage of choice! Kara is a tabletop styling expert and her champagne party table is nothing short of perfection. From stacks of perfectly tiny pancakes to mini champagne bottle party favors adorned with custom printed marble blush wine gift tags saying “Champagne is always the answer,” this party is evidence that a simple theme executed with precision results in a seemingly effortless, yet totally perfect, party. The table settings at Kara’s party are beautiful, on trend and complete with personalized party accessories that pull it all together. The custom modern monogrammed favor boxes and personalized foil stamped nouveau shaped coasters complement her lovely flatware, cloth napkins and dishes for a totally cohesive look. From her handmade balloon garland designed to look like champagne bubbles, to her expert layering of texture and shimmer on her place settings, Kara shows us how to style a gorgeous champagne party. 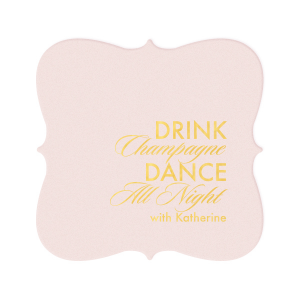 Be inspired by her champagne party ideas, and start designing yours today!